← How to change date by PDF Text Replacer GUI version? Question:How do I minimize margins when printing 2 pages per sheet of a PDF? Whenever I print 2 pages per sheet, the font size shrinks unnecessarily. There are huge margins all around (but especially on the top and bottom). Is there any way to make some adjustment to get rid of the large margins and let the text fill up more of the page? Thanks. Answer: According to your needs, VeryPDF provides two options for you. One is that you can cut margins first by software VeryPDF Advanced PDF Page Crop and then print it. The other is that print PDF directly by software VeryPDF PDFPrint Command Line, which can help you cut margins automatically. In the following part, I will show those two methods one by one. Method 1. Minimize margins by cutting and then print PDF. 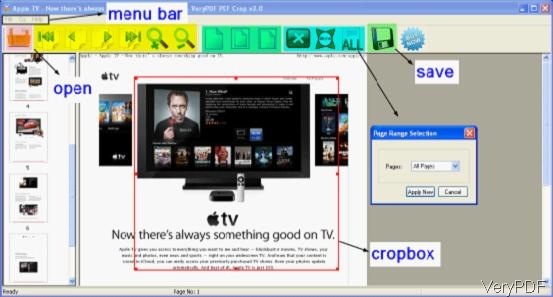 VeryPDF Advanced PDF Page Crop is GUI version software, and it can help you remove the margins of PDF pages and select the page range based on the crop box easily. If you need to know more about it, please visit its homepage. Download Advanced PDF Page Crop and install it. When downloading finishes, there will be an exe file. Please in this software by double clicking the exe file and follow installation message. Once installation finishes, there will be an icon on the desktop. Please launch this software by double clicking the icon. The following snapshot is from the software interface. All you need to do is that add PDF file to software and then draw an area around the content where you need to save as a new PDF. And then save it. By this way, you can cut margins of PDF easily. VeryPDF Print Command Line is Windows based command line software, it is professionally developed for printing PDF. And it can help you print PDF and cut margins directly. Download PDF print. Once downloading finishes, there will be a zip file. Please unzip file then check elements in it. Call PDFprint in MS Dos Windows. When you need to print PDF and cut margins, please refer to the following command line templates. -printermargins : when you need to reduce to printer margins, please add this parameter. -raster2 : when you need to render PDF page to image before printing, this parameter is helpful. -raster2center : this parameter can help you center the printout when use –raster2. By those two methods, you can print PDF and minimize margins. During the using, if you have any question, please contact us as soon as possible. How to call pdfprint.exe from Server 2008 R2 IIS PHP to print the PDF files? How to print PDF in color via a command line? This entry was posted in PDF Print and tagged print PDF. Bookmark the permalink.